Tintagel Guest House - Gardens Cape Town Accommodation. 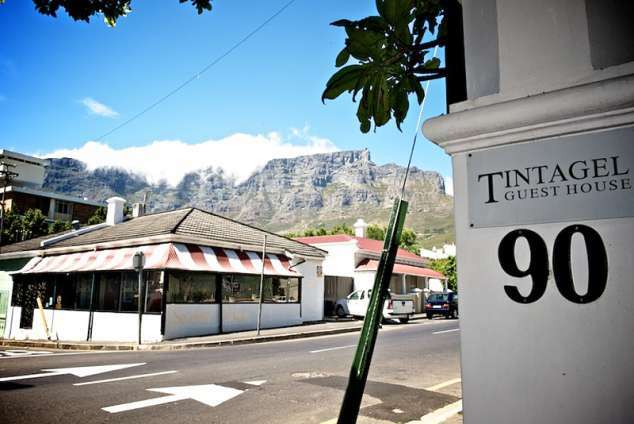 Tintagel guesthouse is located in Gardens, an established residential area in Cape Town's city bowl. Tintagel would appeal to visitors seeking secure, central accommodation. Guests are close to local restaurants, cafes and pubs in Kloof Street and Long Street. Five double en-suite (shower facility only) rooms with air conditioning, comfortable beds and quality bed linen. Three of the bedrooms have access to an enclosed garden courtyard. Rooms have flat screen television, security safe, international plug points, tea tray and hair dryer. Room 3 choice of king- size bed or twin beds. Courtyard room 4 queen- size bed. Courtyard room 5 queen -size bed. Courtyard room 6 choice of king- size bed or twin beds. This room is situated on the upper level. Internet access is included in the room rate. Fax, copy and scanning facilities. Open street parking is available in the guesthouse forecourt. The city centre and international convention centre is less than 3km away. The 17th century Company Gardens and Houses of Parliament. The South African Iziko Museums and St Georges Cathedral. Cape of Good Hope Castle, City Hall and Grande Parade. Long Street - vintage bookstores, craft shops and Green Market Square. The Bo-Kaap quarter, heritage of the Cape Muslim settlers. The Noon Gun on Signal Hill. Camps Bay and Clifton beaches. V&A Waterfront and Metropolitan Golf Club. Table Mountain Cableway and Lion's head. The Athol Fugard Theatre and District Six museum. Take the N2 highway and follow the Cape Town signboards. Continue along the Eastern Boulevard. Follow the 1B Cape Town Sea Point CTICC Waterfront Strand Street sign to the traffic light intersection. Continue along M62 Buitengracht Street towards Table Mountain, following the Cableway signs. Look out for a CALTEX garage on the left. Cross over the Buitengracht / Buitensingel Street traffic light intersection. (Do not turn left!) You are now in the New Church Street section. Spot the Backpackers Travel Centre nr 74 ahead on your right. Slow down and move into the right lane â€“ you are now 50 meters away from the entrance. If you miss the entrance gate, turn immediately right into Milner Road and right again into Upper Buitengracht Street. Turn right into Military Road which is 50 metres ahead. Turn right into New Church Street again. 21239 page views since 03 Aug, 2006. Last updated on 12 Jul, 2018.